Some common questions about acupuncture are answered below. Call me if you have other questions or if you are interested in improving your life through acupuncture treatment. Acupuncture is a natural and effective form of health care that has evolved into a complete and holistic medical system. Practitioners of acupuncture and Chinese medicine have used this non-invasive medical system to diagnose and help millions of people get well and stay healthy. During the initial exam a full health history will be taken. Questions will be asked regarding symptoms, health and lifestyle. I also may check pulses and your tongue and may conduct a physical exam. This information is then organized to create a complete, accurate and comprehensive diagnosis of where Qi has become blocked or imbalanced. After the interview process, you will receive an acupuncture treatment. Very fine needles will be inserted into a variety of acupoints. When they have all been inserted, you will rest for about 20-30 minutes in a dimly lit room with soft music or a guided meditation. This time resting is vital to the outcome of the treatment. The more relaxed you get during the visit, the better the results of the treatment. 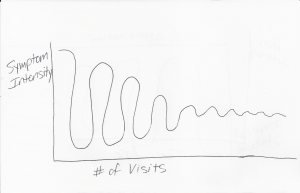 Visits may last from 45-90 minutes. Why did Toni want to feel my pulse? There are twelve pulse positions on each wrist that I will feel. Each position corresponds to a specific meridian and organ. I will be looking for twenty-seven individual qualities that reflect overall health. If there are any problems, they may appear in the pulse. Why did Toni want to look at my tongue? The tongue is a map of the body. It reflects the general health of the organs and meridians. I look at the color, shape, cracks and coating on your tongue to help me arrive at an accurate diagnosis of your pattern of imbalance. A healthy tongue should be pink with a thin white coating. The shape should be smooth and without scalloping on the edges. The vessels underneath the tongue, should not be dark and bulging. Why did Toni recommend herbs? Herbs can be a powerful adjunct to acupuncture care. They are used to strengthen, build and support the body or to clear it of excess problems like a cold, fever or acute pain. I may suggest starting with acupuncture and then adding herbs to your treatment in the future. This is suggested to build up your internal strength so you can achieve faster healing. Yes, definitely. In most instances children actually respond more quickly than adults to treatment. If your child has an aversion to needles, I have a variety of non-needle techniques that can effectively stimulate the acupoints to balance the body. See the “Pediatric Treatment” tab under the “Services” tab for more detailed information about treatment for infants, toddlers, children and teens. If you are giving your child more medication than you want, I highly encourage you bring your child in for treatment so we can find an alternative solution to pharmaceuticals. The majority of children that visit me, ask their parents when they can come back for another treatment. Acupuncture treatment is a therapy, not a magic cure. The effectiveness of treatment is cumulative, each visit adds to the prior visit. It is common to need 6-20 treatments in order to achieve patient graduation, which is my goal. The more severe the issue, generally, the more treatments you will need and the closer together they need to be scheduled. The first treatment usually brings down intensity in someone with a high intensity condition. Sometimes, the symptom completely goes away after the first treatment, but the condition will generally come back. Therefore, it is very important to treat again. The symptom reduces more then comes back. There is a yo-yo effect in the beginning, where pain improves, returns to a lesser degree and improves some more. This is called the Curve of Recovery from the Problem (see graph below). Eventually, the condition will start to plateau. The first five treatments usually will dramatically bring the symptoms down. Then there will be a stubborn 10-20% of symptom intensity remaining. The last 10% can take as many treatments as the first 90% to cure. Here is an analogy to help you understand this concept better. It is easy to cut down a tree, the hard part is digging out the roots and cleaning up the mess. Many people say, “then this is not permanent relief.” I say, it is permanent relief if you follow through on the treatment plan. If you only have two or three treatments, then you are right, it is likely that you will experience temporary relief and the pain will return. If temporary relief is experienced, then treatment has not been close enough together or there have not been enough visits. Some patients need to be seen daily in the beginning, if the disorder is severe. Why? Because in 5 treatments you will be much better, then we will slow down the treatment interval. Your next visit has to be before the symptom gets back to the original level of intensity. It is my goal to graduate my patients with complete recovery from their condition. Acupuncture treatment is a therapy, however, so yes, you really need to come 6-20 times fairly close together. This is how acupuncture works to heal the body. It is a therapy, it is not receive one treatment and you are done, completely healed. Physical therapy, massage therapy, chiropractic therapy, even chemotherapy and radiation therapy are all therapies that require multiple visits to cure a condition and no one questions it. Acupuncture is no different. In general, chronic conditions usually take longer to resolve than acute conditions. Occasionally, a person will get lucky and only need one treatment. I wish I could promise that for every patient, but this is the exception to the rule. The effectiveness accumulates with every treatment received. Once a patient is graduated, they may decide to come in quarterly, as the seasons change for a “seasonal tune-up”. A different pair of meridians are active during different seasons, so coming in at that times helps facilitate a smooth transition of the dominant energy flow and can reduce potential symptoms that may flare up at this time. Rates vary and depend upon what procedures are performed. Most visits are $95 for a one hour visit. Refer to the “Services” tab for specific prices for the varying modalities. I do offer a 15% discount for new patients. Insurance coverage varies from state to state. In Florida, BCBS of Florida, Medicaid, Medicare and Medicare supplement policies DO NOT cover my services. Some Aetna, Cigna, BCBS Federal Plans, BCBS of Minnesota, and BCBS of NY plans do provide coverage for my services. Every plan is different, so it is up to you to confirm coverage with your insurance company. If you are a veteran, often you can get a referral from your primary VA doctor and a preauthorization for coverage, at no out of pocket cost to you. Through August 2017, Choice Insurance through HealthNet will cover your visits if you are preauthorized. 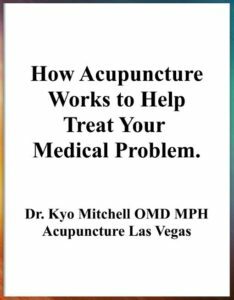 Will my plan cover acupuncture performed by a licensed Acupuncture Physician? How many visits per calendar year am I allowed? Do I need a referral from another provider? Are there specific diagnosis codes that must be used for coverage? Examples include pain condition or anesthesia only. What is my out-of-network co-pay per visit? Do I have an out-of-network deductible? Write down and bring in any questions that you have. I am here to address all of your health care concerns. Fill out the intake forms prior to your visit time and be sure to bring them in with you. The forms are available under the “Patient Portal” tab. Wear loose, comfortable clothing that allows for easy access to your knees and elbows. Bring in a complete and detailed list of all medications and natural products that you are currently taking. Acupuncture is extremely safe. It is an all-natural, drug-free therapy, yielding no side effects just feelings of relaxation and well-being. There is little danger of infection from acupuncture needles because they are sterile, used once, and then properly discarded. Usually, patients report that side effects of treatment are that symptoms they did not mention disappeared, without them being targeted specifically. That is the beauty of this medicine, when we correctly diagnose the pattern of imbalance and then correct it, the entire body shifts and everything improves. Today, acupuncturists undertake three to four years of extensive and comprehensive graduate training at nationally certified schools. All acupuncturists must pass a national exam and meet strict guidelines to practice in every state. Each state requires that continuing education be completed annually. To be a nationally board certified acupuncturist, even stricter continuing education requirements must be met. For more about my education and training, please see the “About Me” tab.